Green tea is a variety of tea brewed from the dried leaves of the Camellia sinensis plant. Unlike other teas, green tea is not fermented. Instead, green tea is made by pan frying or steaming Camellia sinensis leaves, then cooling down or drying out the leaves to prevent oxidation. This gives the drink its green appearance and unoxidized taste. There are thousands of varieties of green tea, with the most well-known ones being Matcha, Shincha, Hojicha, and Gyokuro. Green tea contains an impressive amount of bioactive compounds or polyphenols that can reduce the harmful effects of free radicals on the body’s cells and molecules. The polyphenols include flavonoids and catechins. Epigallocatechin gallate (EGCG), the most abundant type of catechin in tea, has been cited as one of the main causes behind the potent medicinal characteristics of green tea. EGCG has antioxidant properties more powerful than that of vitamin C.
The polyphenols in green tea are said to have anti-tumor effects that decrease their growth. These same antioxidants are believed to have a protective effect from oxidative damage. 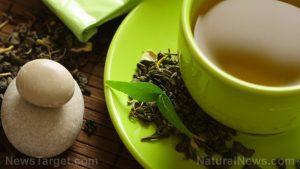 Regular consumption of green tea has been shown to reduce the risk of several types of cancer, such as breast, prostate, colorectal or bowel, and skin cancer, making green tea an effective aid in cancer risk reduction. Furthermore, green tea has twice the amount of anti-mutagenic and anti-cancer tannins as black tea. The cardiovascular system can benefit from drinking green tea. Antioxidants present in green tea decrease triglycerides and low-density lipoprotein (LDL) cholesterol. In addition, they protect LDL particles from oxidation. These significantly minimize the chances of stroke, atherosclerosis, and other heart diseases. Green tea can be purchased in single tea bags and loose leaf tea. The latter is the preferable option since loose leaf tea offers more health benefits than tea that has been pre-bagged. Green tea can simply be taken as warm tea. If a cooler drink is desired, just steep tea leaves then mix with ice and honey. This concoction can be stored overnight and then enjoyed in the morning. Matcha, finely ground powdered green tea, can be taken in more ways than one. Apart from tea, matcha can be used to flavor brownies, cakes, marinades, popsicles, oatmeal, protein bars, and even oatmeal. Green tea increases fat oxidation and metabolic rate and can, therefore, be an efficient weight loss aid. Drinking green tea has been shown to decrease body fat, especially abdominal fat. Green tea has been associated with improved dental health. The catechins in green tea can inhibit the growth of Streptococcus mutans, the bacteria responsible for plaque formation and a leading cause of tooth decay and cavities. Since green tea has caffeine, people with caffeine sensitivity should be careful when consuming green tea.